Category: proposed1b in Gauteng, Limpopo, North West and Mpumalanga, 1a in the rest of the country (NEMBA) and 1 in CARA. 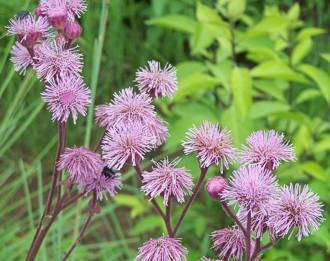 Erect, perennial herb with fluffy pink flowerheads. Stems green to purplish, up to 1.3 m high, dying back annually to a root crown. Leaves are light green, scattered along the length of the stem but clustered at the base to form a rosette, up to 80 mm long and 20 mm wide, margins are serrated. Flowers light purple to pink compact flowerheads that are situated terminally, flowers December-March. Native to South America (Argentina and Brazil), Central America and Mexico. In South Africa it is emerging in the following provinces: Mpumalanga, Limpopo, North West, KwaZulu-Natal, Eastern Cape and Free State and established in Gauteng. Produces fluffy seeds that are wind dispersed. People contribute to spreading the seeds through carrying them in the mud on their vehicle’s wheels or by picking and discarding the mature flowerheads and thereby spreading the seeds. It can also regenerate from underground root stalk. Pompom weed was probably introduced in South Africa as an ornamental plant. The earliest record in the Pretoria National Herbarium is of a specimen collected in Johannesburg in 1962. Currently it is most prominent in Gauteng. The earliest record of its establishment in the wild is from Fountains Valley, Pretoria in the early 1960s and Westville near Durban in 1972. In the 1980’s its distribution expanded in the Pretoria area, and it was also recorded from Hilton in KwaZulu-Natal and Wolkberg in Limpopo Province. In the 1990’s it spread further to Port St Johns in the Eastern Cape, Rooiberg in Limpopo and Nelspruit in Mpumalanga. From 2000 to 2003 it exploded in Gauteng and in the Free Sate the first record was in Kroonstad. During the same period there was much spread in the Nelspruit, White River and Barberton areas. By 2006 it had spread to the Piet Retief area in south-eastern Mpumalanga and Swaziland. Threatens the survival of grasslands and wetlands throughout South Africa as it can tolerate a wide range of habitats. It transforms the landscape from green to pink in summer. Herbicides registered for use on pompom weed are Plenum, Access and Climax. The two physical methods including uprooting and burning of the plant. Biocontrol is currently under investigation. For a guide on herbicide application contact us on the details below. Report citings of these plants to the Early Detection and Rapid Renponce team (EDRR). We will need to know its locality (the exact locality, supply any landmarks or GPS information if possible). Henderson, L., Goodall, J.M. and Klein, H. 2003. 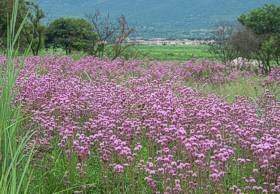 Pompom weed: an invader of grasslands that threatens conservation and agriculture in South Africa. Agricultural Research Council-Plant Protection Reaserch Institute.